The NBA Draft is where dreams come true for the young kid who slept with his ball at, woke up and put up shots first thing in the morning, studied their favorite players and made every move to make their dream a reality. This year’s draft was one for the ages as we seen some teams make their best move to build a championship team through draft picks a la San Antonio Spurs , some building for their future and other just to make a great roster to attract potential free agents. Most teams maximized their efforts for each while other did not have a chance to do anything. I have come up with a few awards to highlight those who made great decisions for the future, the present along with those who missed out on opportunity. The Jefferson Awards, if you remember the theme song “Moving on up ….” , is given to those who want to make their teams better to compete to that next tier of NBA teams and not just sleepers anymore. Charlotte Hornets: After gaining the former name back, they are going back to the franchise past ways. Establishing young talent and watching the pieces grow together and ultimately making their own way basketball rather than playing at the leagues pace. The Hornets added big man Noah Vonleh along with P.J. Hariston to holster their bench and continue to add depth to their young, hungry roster. Vonleh alongside Jefferson and Zeller give great depth and has a lot to learn from legend Patrick Ewing. Hariston, despite his issues at UNC and spending the year in the D-League, can flat out score and shoot the ball and gives a great spark off the bench and can spread the offense if chosen to start. Phoenix Suns: The Suns appeared to become America’s underdog once again after a season that looked promising was cut short during the last weeks where their playoffs hope were taken away from the Grizzlies and Mavericks. The Suns have a great future ahead and have even more depth by adding T.J. Warren and Tyler Ennis. Warren adds great scoring ability that has shown at NC State during the past seasons and give Jeff Hornaceck another piece to put in to his puzzle. Tyler Ennis is true point guard coming out of Syracuse and can help take the load of Gorgan Dragic and Eric Bledsoe. The Mario Chalmers award. As you know Mario Chalmers failed to show up in this years finals is the reason why these teams were chosen for the award, they failed to show up during the draft. Indiana Pacers: A team that looked as if they could potentially win the title this year, failed to even draft this year. After trading their only pick at 57, they failed to address that void at the point guard spot. George Hill is good player but cannot be a starting point guard on this current which needs a floor general. Golden State Warriors: After not making the trade to try to acquire Kevin Love as reported earlier, the Warriors did not try take advantage of the draft either. Failing to address a big need in a big man that can stay healthy and remain a back as Jermaine O’Neal and Andrew Bogut are plagued by injuries. The Underdog award. These players will play with a chip on their shoulders as they were overlooked by many different teams for what reasons, they want to know but are make those guys look crazy ultimately. Julius Randle: After coming as top 5 prospect in his freshman year of college, Randle was poised to be a traditional post player with a NBA ready body. Randle help lead his Wildcats to the National Championship game and was overshadowed by many teams but has been put the right spot to be paired up the Black Mamba. Shabazz Napier: Lebron tweets “My favorite player in the draft! #Napier” then he is traded the Miami Heat, way to go Charlotte. Napier led his Huskies to the National Championship this past season and gives the Heat what they need at the PG. He is beyond hungry and if Lebron goes back to Miami will be interesting combination. Apple award. Steve Jobs had planned to innovate the future and these teams are planning to make a big splash in the league maybe not this year but in years in the future. Orlando Magic: They draft Gordon at #4 who looks to be the second coming of Blake Griffin then following up with a trade up Elfrid Payton at 10. Gordon, Oladipo and Payton can be a great trio that bring Orlando back to prominence in the near future. Philadephia 76ers: The Sixers added Joel Embiid to pair alongside Nerlens Noel which could be a freighting front line for the future years to come. With MCW and their lottery pick for this upcoming season, the Sixers are going to force in the upcoming seasons. 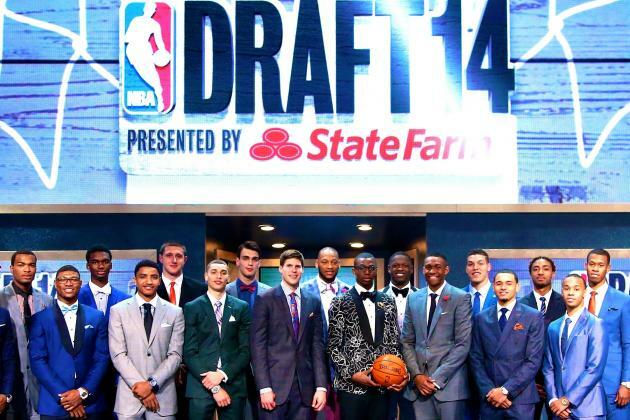 The 2014 NBA Draft gave us a great deal of talent that we will be watching for the upcoming seasons and surely give the NBA a great promising future to add along to a star studded league. Should be interesting to see how all the talents pans out for their respective teams.